Bangladesh's foreign secretary said Thursday his country will need to stop accepting more refugees from Myanmar and accused its government of being "obstructionist" about bringing back more than 1 million Rohingya Muslims who have fled violence. Myanmar, meanwhile, continued to insist it is taking steps toward their return. Its ambassador appealed for patience from the U.N. Security Council, but several members complained about what they saw as lagging progress nearly a year after a council delegation traveled to see the crisis firsthand. After a renewed flare-up in violence in Myanmar's northern Rakhine State, new refugees are still crossing the border to Bangladesh, Foreign Secretary Shahidul Haque said. "As far as repatriation is concerned, the situation has gone far from bad to worse," he told the council, adding that his country "would no longer be in a position to accommodate more people from Myanmar." He didn't say when that might occur. More than 700,000 Rohingya have fled to Bangladesh since August 2017, when Rohingya militants attacked Myanmar security forces in Rakhine, triggering a massive military retaliation that U.N. investigators have called genocide. The exodus came after hundreds of thousands of other Rohingya escaped previous bouts of violence and persecution. Most people in Buddhist-majority Myanmar don't accept the Rohingya Muslims as a native ethnic group. They are, instead, viewed as illegal immigrants from Bangladesh, though generations of Rohingya have lived in Myanmar. Nearly all have been denied citizenship since 1982 and lack access to education and hospitals. The U.N. General Assembly approved a resolution in December strongly condemning "gross human rights violations and abuses" committed against Myanmar's Rohingya. Myanmar has made agreements with Bangladesh and U.N. agencies to repatriate the Rohingya, but it hasn't happened. A plan for refugees to begin returning last November was scrapped because officials couldn't find anyone willing to go. Myanmar had said it was ready to receive them, but U.N. officials, human rights activists and others had called for waiting until the refugees' safety in Myanmar could be assured. The Bangladeshi foreign secretary said Thursday his country had "tried everything" with Myanmar but met with "hollow promises and various obstructionist approaches." He urged the Security Council to visit the Rohingya refugee camps again and set up "safe zones" for people of all backgrounds in conflict-torn parts of Myanmar. Myanmar's U.N. ambassador said his country was taking steps to facilitate the Rohingya's return. The envoy, Hau Do Suan, pointed to three dozen small-scale community projects planned "as soon as the security condition permits" and to a recent investment fair meant to generate development in Rakhine. "We seek your understanding of the practicality and possibilities on the ground," Hau told the council, adding that building trust in Rakhine "takes time and patience, as well as courage." The Rohingya crisis has been a sensitive subject in the council, where Myanmar's close ally China is among members with veto power. 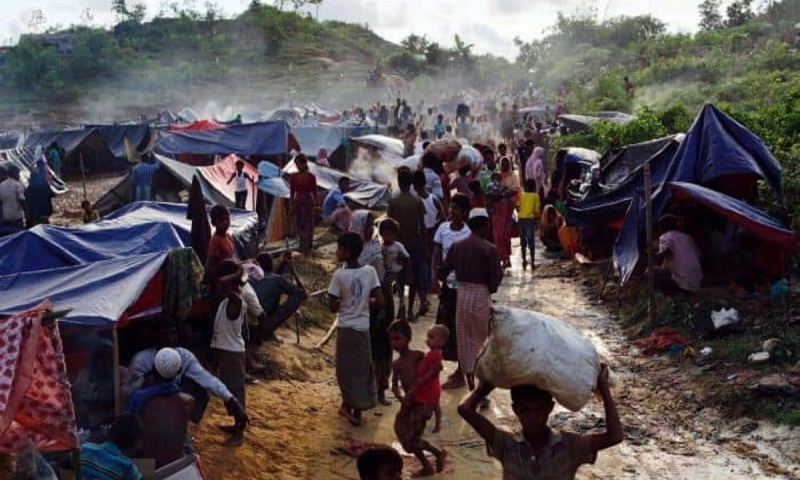 The council did visit Myanmar and Bangladesh last April and May, and members last summer urged stepping up efforts to enable the Rohingya to return. Several countries on the council vented frustrations Thursday. "The time has come for the government of Myanmar to assume its responsibility to protect its citizens" and for the council "to use all means at its disposal to make tangible progress," said the Dominican Republic's envoy, Jose Singer. But Russia and China advised the group not to be strident. "The international community should keep its patience," Chinese Deputy Ambassador Wu Haitao said.